Zion National Park is a wonderful place to stay. The culture, food, experiences and diversity are one in a million here due to the locals, tourists and visitors that the park attracts. 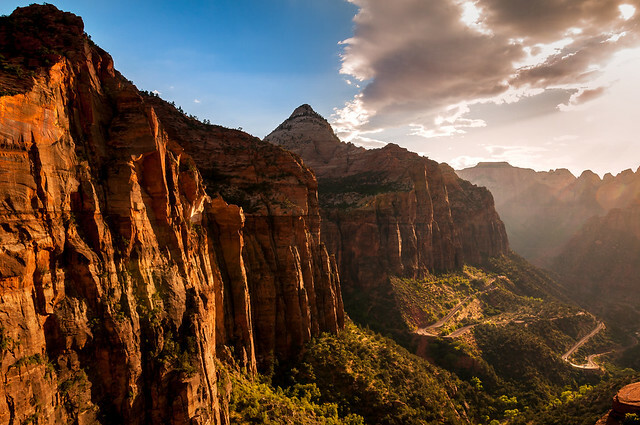 Staying in Zion is something that most people would dream of. There are many benefits to be reaped from lodging in Zion National Park. Imagine waking up, and walking outside into the fresh air, and seeing one of the most picturesque places in the world right at your feet. The sights you get looking from the window of a room in Zion is unbeatable and beyond beautiful. Then night comes, and you look up to see thousands of stars so clearly due to the little amount of light pollution. How much better can it get? Much better. No need to worry about what to eat or packing a lunch just because you are going to a “Park”. Zion offers some of the best restaurants in Southern Utah. The food here is absolutely mouth watering and delicious. Don’t worry about price either, there is definitely something here for all budgets and all are just as tasty as the next. Obviously the hiking here is near unbeatable. Reap the benefits of being able to wake up and walk out to the shuttle and pick a hike to take. No worries about where to park as your car is safely tucked away in the lodge parking lot. Afterwards, no stress of having to drive a long distance before showering or relaxing as your room is right in the park! Making your trip as convenient as it can get. Staying in Zion gives you an opportunity to experience a nightlife unlike any other. Meet people from all around the world, enjoy bars that are top notch, beautiful night skies and all around fun. The nightlife in Zion is one of a kind and something everyone should enjoy! Hiking is something that my wife and I have been passionate about for a long time. Because of our passion, we try to vacation as much as we can to find all of the best places to hike and to visit. We have heard a lot about Zion National Park and my wife and I decided that we are going to plan a trip there. Because there are so many things to do if you stay in Zion’s like the night life, I think that my wife and I are going to stay at the park.